Electrical Safety Testing in the Workplace – why should you be doing it? Because all workplaces are required to. It’s as simple as that. The OHS&W Regulations require all portable appliances and RCDs (safety switches) to be tested regularly. How can workplaces best manage electrical safety testing to ensure compliance with the Regulations? *All testing must include a thorough physical and visual inspection for mechanical damage. The legal requirement of the OHS&W regulations 1995 is that all persons performing electrical safety testing are competent and trained in the use of the equipment. Clause 2:5:7 and the Australian Standard AS/NZS 3760, requires the Manager or Supervisor to be responsible for ensuring competence. easytest electrical safety testing appliances are designed to test to this Standard. No liability will be accepted if the equipment is used for any other purpose than it is designed for, or by use by non-competent persons as defined in the Standard. If any part of the instructions are not clear, or fully understood, please contact us before proceeding. 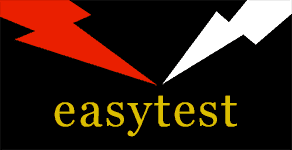 easytest Pty Ltd endorses and recommends training and instruction to become competent in performing electrical testing. The links below are to assist you to access information regarding the Australian Standard AS/NZS 3760 and electrical safety in the workplace.